This match between Olympic gold medalist Kurt Angle and “the Heartbreak Kid” Shawn Michaels is criminally under-appreciated in the annals of wrestling history. This was a personal dream match of mine. In my opinion, Michaels and Angle were the 2 best in-ring performers in the company at that time. They had never squared off in a one on one scenario going into Wrestlemania, but were finally going to get that opportunity on the grandest stage of them all. If you want to get a friend to become a fan of professional wrestling, just show them this match. There was no stipulations, blood or foreign objects involved. It was just a 30 minute wrestling clinic from 2 of the greatest of all-time. Moment of the match: Kurt Angle delivering the Angle Slam to Michaels from the top-rope and only gaining a two-count. This was what a brother vs brother match was supposed to be. It wasn’t some fraud like Kane/Undertaker and Edge/Christian. 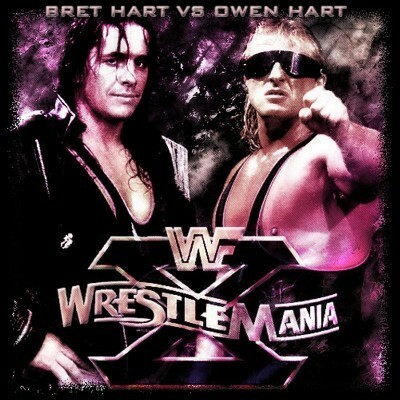 Bret and Owen were actual brothers. They knew each others strengths and weaknesses and put on one hell of wrestling match to OPEN Wrestlemania 10. What was most shocking about this match was that Owen actually won! He was always considered to be the lesser of the two Harts but still ended up winning in the end. The loss ultimately didn’t hurt Bret as he went on later in the evening to defeat Yokozuna to become World Wrestling Federation Champion. 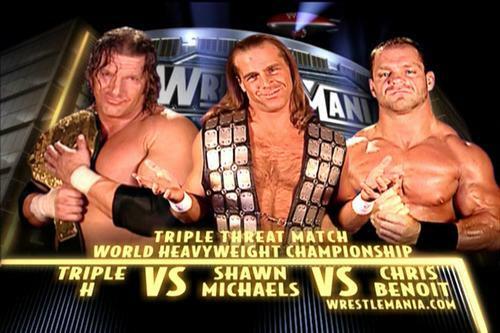 This match will always be tainted in WWE history because of the inclusion of Chris Benoit, but that shouldn’t take away from the match itself and the amazing story behind it. Chris Benoit had been in the business for 18 years but was just now receiving a mega push to the top. He was coming off a Royal Rumble victory and was ready to challenge for the World Heavyweight Championship against Triple H. HBK was later added to make it a Triple Threat because many in the company (more than likely) believed that Benoit/HHH couldn’t draw on their own. The New York City fans were solemnly behind Benoit. They were so behind him that they were even booing Shawn Michaels during the match. Everyone who was a fan of the sport wanted Benoit to finally win the big one because of all the hard work he had put in over his career. When Chris slapped on the crossface submission to Triple H and made him tap out, the crowd went absolutely nuts. What made the ending even more special was WWE champion Eddie Guerrero coming to the ring and embracing his friend Benoit. Eddie and Chris hoisting their respective championships in the air with the confetti raining down from the sky always brings a tear to my eye. Moment of the match: Chris Benoit putting the Crippler Crossface on Triple H and making him submit to become World Champion. Remember when tag team wrestling actually meant something in the WWE? 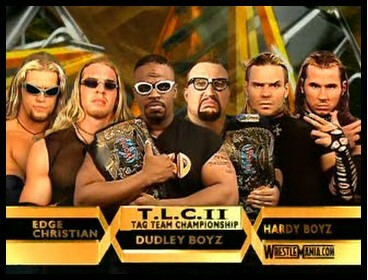 Edge and Christian had their chairs, the Hardyz had their ladders and the Dudleyz had their tables. What it all added up to was one of the most violent tag team wars in wrestling history. Not only did you get these 3 tandems, but you also got Spike Dudley, Rhyno and Lita involving themselves in the match as well. Tables were broken, bodies were falling left and right off of ladders and skulls were constantly getting cracked with steel chairs. The match was more or less a spot fest, but what a spot fest it was. On a card which featured the great Hulk Hogan vs Andre The Giant, this match perhaps stole the show. I remember listening to Chris Jericho do an interview about 10 years ago on the first time he met Ricky Steamboat at an autograph signing. He asked the Dragon about this match and where it ranks on his all-time favorites. From what I recall, Steamboat said that he and Savage choreographed the entire match from start to finish. They had a list of moves they wanted to get in and pulled off every single one in chronological order. That’s pretty amazing considering the match ended up being 15-16 minutes and every move performed was near perfection. I would have liked to see George Steele not influence the decision, but that’s just nitpicking on my part. Savage vs Steamboat at Wrestlemania 3 will live on in infamy. Moment of the match: Savage delivering the double axe handle to the outside on Steamboat. 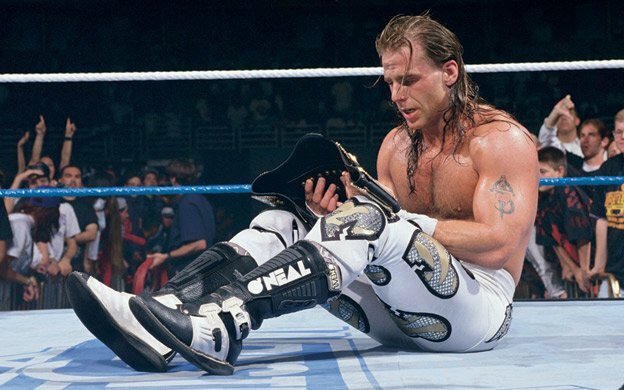 This match was the last of Shawn Michaels career. That distinction alone should be enough to get this on the list. This was also the sequel to one of the greatest matches of all-time (which I’ll get into later on). It was hard for these 2 to outdo what they did Wrestlemania 25, but they sure were close. The WWE made a wise decision and had these 2 close out the show instead of having the standard WWE Championship match. Considering the circumstances and stipulations of the match, it was the right move on their part. The Undertaker and Shawn Michaels tore down the house for the 2nd straight Wrestlemania and had the crowd right in the palm of their hands from start to finish. In his final act of defiance, HBK slapped the Undertaker right across the face before receiving a tombstone piledriver to end his career once and for all. Wrestlemania will never be the same without Shawn Michaels. What an amazing end to an amazing career. Moment of the match: Shawn Michaels kicks out of the first tombstone piledriver. Not only was this match amazing, but it changed the course of the company’s history. This was the match that catapulted Steve Austin into superstardom. This submission war with Bret Hart showed the world the Stone Cold that we would be getting for the next 5-6 years. He was a brawler who had a never say die attitude that the fans would eventually fall in love with. Watching Steve get put into the sharpshooter only to pass out from the blood loss is one of the most iconic images in wrestling history. He never submitted and he never tapped out. He walked into Wrestlemania 13 as the hated heel, but he walked out with the respect of his peers and the admiration of the fans. What happened in the years following this match is history. Moment of the match: Steve Austin struggling to stay conscious as he is locked in the sharpshooter. Whenever Steve Austin and The Rock square off, it’s always magic. Their match at Wrestlemania 17 was no exception. It was one of the most anticipated main events in the history of the company. You had the 2 biggest stars in the world facing off in front of 70,000 fans at the Reliant Astrodome in Houston. It was hard to predict which man was going to emerge with the belt because let’s face it…it’s Austin vs The Rock. The idea of either man losing was hard to fathom. Austin’s heel turn and eventual alliance with Vince McMahon at the end of the match shocked everyone in attendance. Steve and Vince had been at each others throats for years. 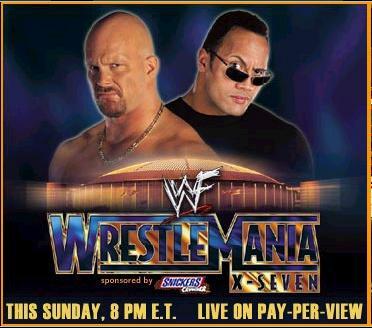 Even though Austins heel run was considered a flop, the shock value of it actually taking place in the main event made for one memorable Wrestlemania moment. Moment of the match: Austin wailing away on the Rock with a steel chair with McMahon cheering him on. It’s hard to keep the fans attention for more than 20 minutes, let alone an hour. In a match that didn’t even see one pinfall for 60 minutes, Bret Hart and Shawn Michaels managed to do just that. There were points during the contest in which time was blown on long, drawn out submission holds, but that should be expected in a match lasting one full hour. An eventual overtime period was decided so the match didn’t end in a draw (which would have been TERRIBLE). Shawn Michaels delivered Sweet Chin Music to the bewildered Hart to win the WWF title in dramatic fashion. It takes great conditioning, stamina and perseverance to compete in an Iron Man match. Very few in the world can do it and make it work effectively. Bret Hart and Shawn Michaels both took the ball and ran with it on that night. It was wrestling at its finest. Moment of the match: Hart throws Michaels into the cameraman. Michaels superkicks him right in the face. Not only was this the greatest match in Wrestlemania history, but it could very well be the greatest match in the history of the business. Everyone figured that this would be match of the night, but what we got exceeded all expectations and then some. These 2 took the fans on an emotional rollercoaster. They kicked out of everything. Chokeslams, Tombstones, Sweet Chin Music, Last Rides and Elbow Drops weren’t enough to keep either man down. The finish was to be expected. The Undertaker never loses at Wrestlemania, but Michaels still made you believe that the streak was going to end. That shows the true greatness of Shawn as a performer. He made you think that the impossible was possible. You’ll be hard-pressed to find a match that was as good as HBK/Undertaker at Wrestlemania 25. It had drama, emotion, brutality, heart and soul. Moment of the match: Undertaker diving over the tope rope on to the cameraman and Michaels. This entry was posted in Uncategorized, WWE and tagged Bret Hart, Entertainment, Kurt Angle, Randy Savage, Ricky Steamboat, Shawn Michaels, Sports, Steve Austin, The Rock, The Undertaker, TLC, Top 10, Wrestlemania, Wrestling, WWE. Bookmark the permalink.